It was a pretty interesting and puzzling find, but NASA scientists think they have an explanation. Indeed, it’s not a knob or hood ornament, nor is it made by aliens. A much more logical explanation is uneven weathering and erosion. For the full details head over to Universe Today. 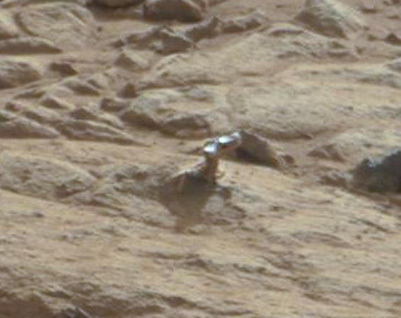 But in short, Ronald Sletten from the Mars Science Laboratory team at NASA/JPL explained in a press release that the object is a small part of the rock that is different in composition from the rest. The shiny part is made up of a harder type of rock than its surroundings. Since the surface of Mars is home to lots of dust/wind storms, there is quite a bit of wind erosion, and the softer surrounding rock erodes aways much faster than the harder rock. The shininess is also a by-product of erosion- certain types of rocks have a tendency to become smooth and shiny from erosion rather that just being blown away. 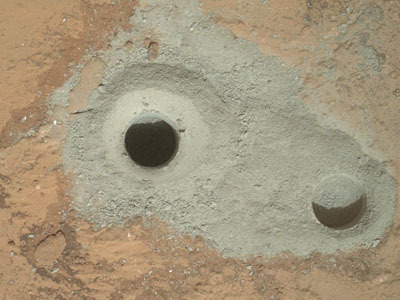 NASA also posted a PDF with some good photos comparing the Mars image to similar phenomena on Earth. What I’m wondering is- what is that harder part of the rock made of? Why is there? Are there any other formations like it nearby? I know that on earth some volcanic rocks have a smooth & shiny appearance, so could this be a chunk of volcanic rock that was flung from an eruption and landed in water, then moved to its current location by fast-moving water and deposited in a muddy area that subsequently hardened into sedimentary rock? Maybe more theories will come out soon. The rover has now successfully tested all of her science instruments and everything is working perfectly. A sample of the pulverized rock was taken, and will be analyzed in the days to come. This rock is suspected of having been altered or eroded by flowing water on the surface many millions of years ago. I’m looking forward to seeing what they find to confirm (or deny) this theory and what else is learned about Mars’ watery past. What’s Developing i am a newcomer to this, I located this I’ve noticed It definitely helpful and contains helped all of us out masses. I dream to contribute & help out different people like the nation’s aided all of us. Great project. przygarbione plecy, W definitywnej sekundzie, kiedy snop reflektora pr. Second, classified ads could be the typical part of an newspaper in places you see job postings, for rent or for sale ads plus a host of similar advertisements. The discussion above offers 3 suggestions that can help to present new life for your posting efforts. the two choices, this is that which you would do. readers look for in the content you post. thinks about himself before thinking of his child.